This will probably drive me out of the cocktail writers’ club, but my regular, recipe-centric, DOTW was preempted by a cold. I know this will make me sound a bit wussy to some of you, but I personally do not find that alcohol “kills the cold germs” It’s more like granting the virus superpowers. Moreover, when I’m sick, some generic Alka-Seltzer Plus more or less does me just fine. In short, liquor has not passed these lips in over a week. On the other hand, being sick also allowed me to wipe my DVR clean of “Mad Men” episodes…including episode 12, “The Quality of Mercy,” which my device decided to turn off about 1/3 of the way through the episode. I tried recording it again last night, but the show my DVR thought was “Mad Men” turned out to be CSI or NCIS or SVU or something else with letters or what not. I’m sure I’ll catch up with it all by next Sunday. The point is that “Mad Men” is whipping up more controversy and hysteria than ever, and it’s lovable/hatable alcoholic antihero/hero, Don Draper, has done more than his share to revive interest in classic cocktails in general and one ultra-classic, in particular, the Old Fashioned. If you want a recipe, as such, you can find not one but actually two if you read my last look at the Old Fashioned closely. That was just a little over two years ago, but the two approaches to the drink in it remain pretty close to the way I often make it now…except I’m slightly more open-minded about the use of soda water. Still, I say keep it minimal if you use it at all. On the other hand, that’s not quite what Mr. Draper does in this memorable scene from a long-ago season when he makes a new and short-lived friend in Conrad Hilton by making him an Old Fashioned. Yes, we’re breaking the format this week and in lieu of a recipe, you’re getting this legendary moment in televisionary cocktailing. Now, watching this again, it occurs to me I’ve never made an Old Fashioned precisely this way. Don uses a bit more soda water than I would prefer. And note how he doesn’t really stir it, but just sort of dashes the bar spoon on the ice cubes a couple of times. On the other hand, his wetting of one sugar cube per glass (they look like rather large brown sugar cubes to me) with Angostura bitters and then muddling them is absolutely classic. The fact that he includes a cheap, bright red, non-Luxardo maraschino cherry in his muddling would, on the other hand, horrify many in the crafty cocktail set, but I don’t think it’s a problem. No, if I were drinking tonight, I’d probably make pretty much exactly that drink, though I’ve never been a big Old Overholt guy. This rye has become the craft bar standard recently — I can’t speak for its popularity in 1963 — but I prefer my bonded Rittenhouse Rye or Don Draper’s favorite not-quite-rye, Canadian Club. (CC, by the way, sponsors a brief tutorial with their version of an Old Fashioned as an extra on the Blu-Ray/DVD of “Mad Men” Season Five.) Right now, I’d be using Bulleit’s Rye, because that’s what I’ve got. I’m sure it would be decent. 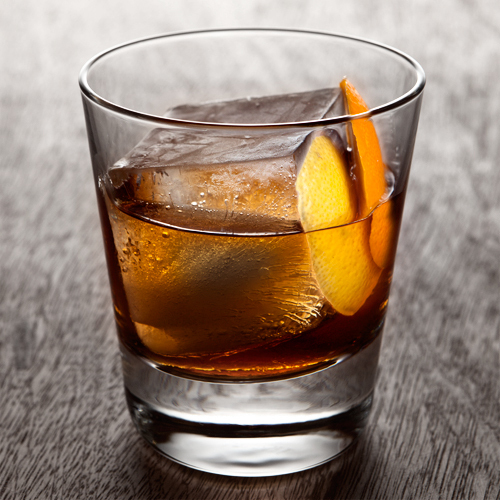 And that’s actually the thing about an Old Fashioned — even more than a Martini or a Manhattan, it’s sturdy and flexible. Paradoxically, it’s also easy to foul up completely, as most non-craft bars do, if you use too much sweetener, water, or even whiskey. One teaspoon for two ounces of whiskey is pretty much the right proportion, and it’s definitely also the maximum if you’re muddling fruit. Also never, ever, use the syrup that comes with the sweet-supermarket maraschino cherries as your sweetener. Don’t. Still, like I said, there’s that a lot of leeway with your Old Fashioned. You can make the very severe kind with only a teaspoon full of soda water, a sugar cube, bitters, and not very much ice — or, the fashionable craft bar favorite, one giant and slow to dilute cube — or you can make the lusher version I mostly lean towards, in which I muddle an orange slice and maybe a cherry, too, while throwing in a splash or two, or three, of plain water and enough ice to fill my rocks glass. There’s an idea out there that there’s one way to make a perfect Martini or Old Fashioned, and I’m here to tell you that’s balderdash. I’ve mad dozens of these drinks in dozens of ways — I’ve even served an Old Fashioned up, shaken, as if it was a Martini or Manhattan — and it nearly always works, at least a little bit. At bars, I’ve had two truly great Old Fashioneds. One was for probably $15.00 at a very high end joint in Century City on November 4th, 2008 and used Michter’s Rye (or maybe Bourbon). The other was a $3.00 happy hour beverage with the well bourbon (Evan Williams, I think) by a nameless bartender at the Hudson in West Hollywood several months back. I’m sure they were made in completely different ways. So, I guess what I’m trying to say is that these recipes — all of them — are guidelines. I’ve veered between the various poles of making Old Fashioneds and I’ve yet to find a consistently great way to make the drink, but some of my tries have been very good. Some have also been disappointing. I still think the official recipe I wrote two years back is the most reliable, but my results always vary. It’s pretty much the same way as it goes with a great television series like “Mad Men.” Maybe the season closer will be a real humdinger, or maybe it won’t. We should all just relax and let it be whatever it is. Unless, of course, the nuttier online tea-leaf readers are right and the Manson Family or stand-ins really do end up killing Megan Draper. That, my friends, would be more stupid than sweetening your Old Fashioned with two tablespoons of the cheap maraschino cherry syrup.